Water resources in Dane County are abundant and are important to the economy and the quality of life for the people that live and recreate there. However, water quality in many Dane County streams and lakes has been degraded due to excessive nutrients and sediment contributed primarily by agriculture and urbanization. Streamflow and water-quality data are needed for the determination of trends, assessment of the impact of various practices designed to improve water quality, development and calibration of models, and future water-resource planning. 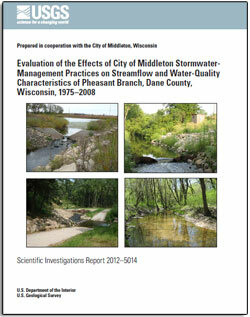 Build a long-term base of streamflow, lake stage, and water-quality data essential for water-resource planning and assessment purposes for streams and lakes in Dane County, with a focus on the Yahara River Basin. Northlake Pond water-quality detention basin in Middleton, Wis., in 2008. Infiltration basin at retail dealership on Airport Road in Middleton, Wis., in 2008. Streamflow-monitoring stations with automatic, 24-bottle water-quality samplers are used to pump samples of streamwater during significant storm-runoff periods at selected tributaries to Lake Mendota. In general, 8-12 samples are selected for laboratory analysis for each runoff period. Monthly baseflow samples are also collected. Concentrations from the samples (mg/l) are combined with continuous streamflow data (cubic feet per second) to compute a daily loads (pounds or tons per day). Note that there is not an automated sampler at the Yahara River at Fulton monitoring station – samples are collected approximately every three weeks and during selected storm-runoff periods. On a rotating basis, four streams in Dane County are sampled for selected water-quality constituents (sediment, nutrients, common ions, and field measurements) three times per year at baseflow conditions during the growing season. There are 19 sites in the USGS sampling rotation: 6 are coldwater streams, 10 are warmwater streams, and 3 are streams that receive wastewater from sewage treatment plans. Each site is revisited approximately every four years. Streamflow, lake stage, and water-quality data are collected at numerous continuous-record sites. The number of monitoring locations can vary slightly each year – this is dependent upon the needs of collaborative partners. Data are available online on NWIS Web. Selected data are also available at INFOS Yahara. Gebert, Warren A.; Rose, William J.; Garn, Herbert S.
Steuer, Jeffrey J.; Hunt, R.J.
Use of a watershed-modeling approach to assess hydrologic effects of urbanization, North Fork Pheasant Branch basin near Middleton, Wisconsin; 2001; WRI; 2001-4113; Steuer, Jeffrey J.; Hunt, R. J. 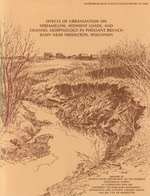 Effects of urbanization on streamflow, sediment loads, and channel morphology in Pheasant Branch Basin near Middleton, Wisconsin; 1986; WRI; 85-4068; Krug, W. R.; Goddard, G. L.